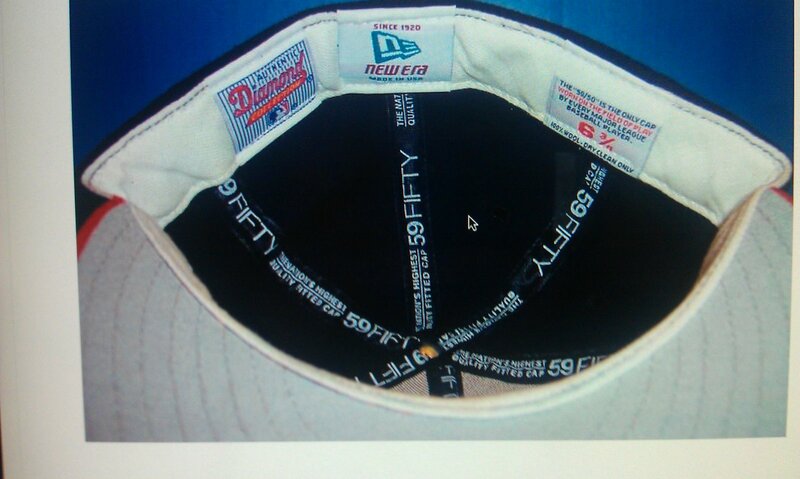 The timeline here shows some of the subtle changes to the inside tags of New Era caps from the mid to late-1990's. Starting with 1996, this particular tag scheme is what I remember most about the caps that I owned from the period. 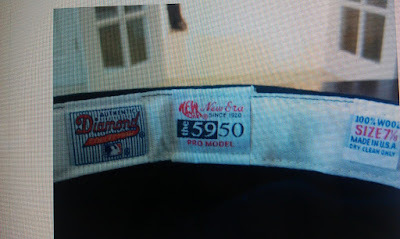 From the tried-and-true "Authentic Diamond Collection" tag to the iconic and simplistic "size tag," everything about these caps screams "official." 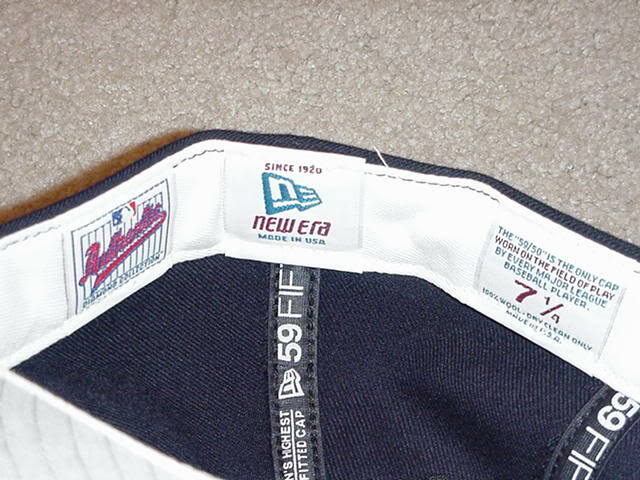 The caps from that year feature the last appearance of the psychedelic script-style New Era middle tag. The New Era tag in the center with the black and white "5950" logo is the first thing you see when inspecting the cap and the one thing you'll certainly notice is the plain black satin taping on the inside of the cap. Of all the iterations of the taping, this one is my favorite in it's seeming lack of design. This would also be the last year that the familiar "size tag" would appear in simple red, white and blue which is a shame because that tag would would always tell you so much without having to say a lot. It told you the size, that it was 100% wool, made in the U.S.A. and (depending on the year) that it was "dry clean only" and that was all you needed to know. The following year gave way to a new approach regarding the tags. Most noticeably, you'll see that the New Era tag in the center features the "flag" that would be the company's most recognized logo. The satin taping is emblazoned with the slogan "59Fifty The Nation's Highest Quality Fitted Cap" and the size tag now reads like a novel with the following information: "The '59/50' is the only cap worn on the field of play by every Major League Baseball player." Then, in 1998, while the New Era tag and size tag did not vary much, you will notice an updated "Authentic Diamond Collection" tag that puts more emphasis on the word "authentic" rather than "diamond" which is more prominent on the caps of previous years. 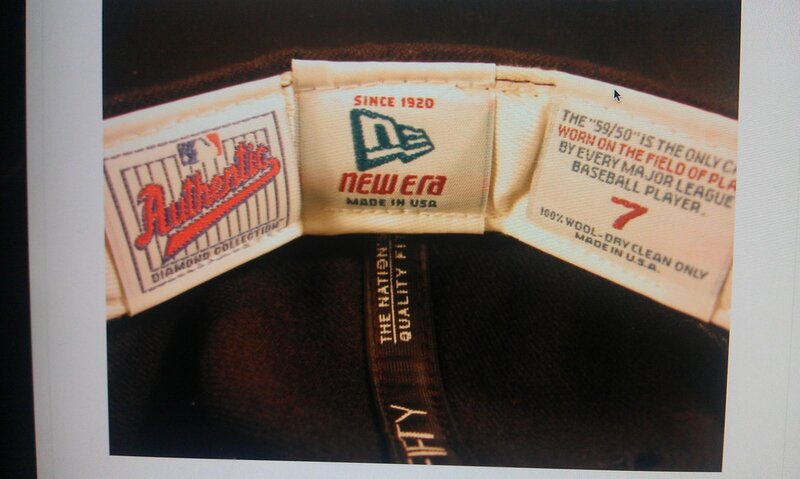 Interestingly, the word "Authentic" is still written in script on the left-most inside tag of every on-field cap up to present date. Also of note for that year (and you can't tell from just looking at the picture featured here) is that the New Era flag is featured on the satin taping, leaving no real estate unmarked there. I haven't noticed any real differences between the caps from 1998 and 1999 so perhaps this is a good bookmark in the conversation of the caps from this particular era.